Dry skin usually looks dull, feels tight because it has a low level of sebum and cracked due to lack of moisture level. Sebum is the natural oil glands produced by our bodies. Sebum keep your skin retain moisture. 1. Dry skin should be treated better than other skin types. Dry skin needs moisturizer and gentle massage regularly to improve blood circulation and activates the sebaceous glands (sebum-producing). 2. Do not wipe the face if you have dry skin. After washing the face, wipe with a soft face. 3. Use moisturizing cream at night. Please note that the cream is better and is recommended for dry skin creams rather than lotions because it contains more oil. 4. Apply a cream or baby oil after a shower. This will help retain moisture. 5. Tips beautiful skin at home including milk cream at night. 6. Because dry skin tends to wrinkle, use the cream around the eyes and mouth. Both of these areas are where wrinkles tend to appear first. 7. Ylang ylang, hyssop, rose, sandalwood, chamomile, essential oils are good for dry skin. 8. Perform exfoliate at least once a week. 1. Choose a moisturizer that has a high oil content. If you have very dry skin, moisturizing oil containing high amounts will work well for you. However, if the level of dryness mild to moderate facial skin, you should use a moisturizer that contains a little oil and water based. 2. 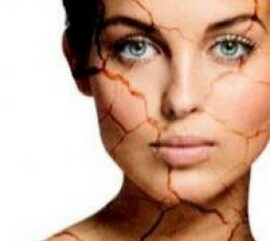 Determine whether the drought occurred in the entire skin of the face or just in some areas of the face only. Many people who have combination skin, where they have an oily face areas in the T zone (nose, forehead the middle, and chin), while other areas face dry, even scaly. If you have combination skin, use a moisturizer that suits your skin type and apply moisturizer only in areas of dry skin. 3. Use a moisturizer to keep the skin elasticity. Look for moisturizers that contain glycerin, dimethicone, hyaluronic acid, and urea 20% for extra dry facial skin. These materials can keep skin supple and hydrated. 4. Buy a hypoallergenic moisturizer. To keep skin protected from allergic reactions to perfumes or other additives, buy a hypoallergenic moisturizer. This will avoid skin irritation due to allergy to a product that will make your skin even more dry scaly. 5. Consider using a natural moisturizer. You could consider using all natural moisturizer, such as olive oil (olive oil). The price will be cheaper if it is used as a moisturizer than prices of other moisturizers sold in stores. In addition, by using a natural moisturizer, skin pores will not be clogged.